What Should You Eat After Getting Dental Implants? 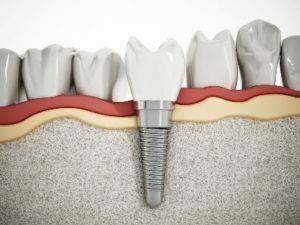 Did you recently get dental implants? Congratulations! You’re on your way to enjoying many years of great oral health. Implants provide superior chewing strength and function for patients who have lost teeth. Not to mention that they look and feel more like your natural teeth than any other option. But what should you eat after dental implants and is there anything you should avoid? Keep reading to find out what the best diet is after getting implants. You’ll also get some great maintenance tips to keep your implants strong and healthy for many years! Although the procedure to have implants placed is much easier than patients anticipate, it’s still a minor surgery that requires some TLC to help the tissues heal. Every patient is different, but it generally takes about 5-7 days for most of the swelling and discomfort to subside. During that time, it’s important to avoid hard, crunchy or sticky foods like popcorn, nuts, hard fruits and vegetables, and crusty bread. How Can You Care For Your Dental Implants Over the Long-Term? Continue good hygiene habits – Although an implant can’t get a cavity, it still needs clean, healthy gum tissue to support it. Ask a dentist or hygienist to show you how to properly floss all the way under the gumline. Use the right tools – Some patients benefit from special brushes, floss or even the use of an oral irrigator. Get regular dental care – Routine checkups are an opportunity for a dentist in Plano to make sure the bone levels around your implants are healthy and that the crown, bridge or denture attached to the implant is functioning properly. The healing process after getting implants will be over before you know it. Then you can use these tips to make sure your beautiful new smile lasts for many years! Dr. Christina Ky is a general, cosmetic and restorative dentist in Plano who knows that her patients not only want great results – they want great results that last. That’s why she always takes the time to explain the best way to maintain dental work so that it can continue looking and feeling great for as long as possible. If you have any questions, she can be reached via her website or at (214) 227-1000. Comments Off on What Should You Eat After Getting Dental Implants?